A good majority got this question right - but there's probably a big element of self-selection. In my experience, people are much more likely to know about the intra-Party purges than brutal treatment of the peasantry. Not bad - a majority got this one right too. The Crimean Tatars were of course also deported under Stalin, but the Cossacks were not, so (D) is incorrect. About 400,000 of the Czar's subjects perished in the horrible famine of 1891-92. About how many Soviet citizens died in the famine of 1920-21? A plurality, but not a majority, got this question right. The deaths from this famine were more or less frankly admitted by Lenin's government at the time - given their shaky hold on power, they chose to lose face and accept foreign humanitarian aid. (28.5) A. The weather conditions in 1920-21 were actually favorable. (5.75) B. Lenin reversed his agricultural policies once starvation appeared to threaten the survival of the Soviet regime. (0.75) C. Substantial stockpiles of grain held by the Whites were captured in 1920. (7) D. Seed grain as well as food for family consumption was requisitioned from peasants as a punitive measure. 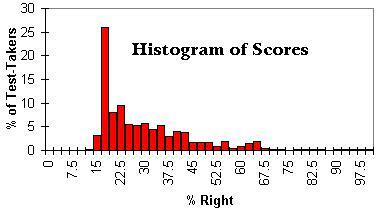 (28.75) E. Both A and D, but not C.
(29.25) F. B, C, and D, but not A. A slim plurality got this one right. The two runner-up answers were mistaken to discount poor weather entirely - it certainly was a factor, even though Lenin's share of the blame was far greater (as comparison with Russian famines in the 19th century indicate). Again, a slim plurality got the answer right. (42.5) A. Deporting "counter-revolutionary" nationalities to Siberia. (4) B. Executing other socialists. (25.25) C. Ordering the assassination or execution of other high-ranking Communists. (8.5) D. Ordering the secret police to use political prisoners as slave laborers on dangerous construction projects. (9) E. A and C.
(10.75) F. B and C.
The right answer came in a distant #2. Lenin's treatment of the Don Cossacks remains almost unknown. Stalin had to order the Kirov assassination and associated witchhunt to break with Lenin's policy of limiting executions to non-Party members. (43.5) A. A wartime expedient, requiring unneeded workers to join the Red Army. (6) B. Never implemented, but would have required "counter-revolutionaries" to contribute at least 20 hours of labor each week to the war effort. (16.25) C. Argued to be integral to the very concept of a centrally planned economy. (7.5) D. Substantially implemented by the war's end, for inflation had almost totally eroded the monetary value of the ruble. (2.25) E. Explicitly stated to be inconsistent with a workers' right to choose his occupation. (24.5) F. C, D, and E.
Trotsky has long been the hero of the disillusioned Communists; probably a big part of the reason is that so few people realize what his "alternative" amounted to: universal compulsory labor, in time of both war and peace. (40) A. Imposing the death penalty for retreat. (4.25) B. Purging the Red Army of former Czarist officers. (2) C. Executing prisoners of war. (2.25) D. Ordering pogroms against Jewish communities to silence complaints that he favored other Jews. (19) E. A and C.
(32.5) F. A, B, C, and D.
Again, Trotsky's crimes remain largely unknown - even though they are extensively documented in official publications and Trotsky's own writings. The correct answer came in 3rd. (38.5) A. Only a few thousand village leaders - almost all of the "kulak" fatalities actually occurred during the Ukrainian famine following the dekulakization campaign. (2.5) B. 100,000 - about as many Japanese who died from the atomic bombs dropped on Hiroshima and Nagasaki. (5.5) C. 250,000 - about equal to the number of Gypsies exterminated by Hitler. (11.75) D. 1.5 million - about as many as the Turks killed in the Armenian holocaust. (13) E. 2 million - about as many as killed by Pol Pot in Cambodia. (28.75) F. 6.5 million - somewhat more than the number of Jews murdered by Hitler. Barely a quarter had a remotely accurate picture of an atrocity the size of the Holocaust against the Jews. How many have even heard of a "kulak"? Dekulakization and forced collectivization were the two main stages of Stalin's attack on the peasantry - first sending potential leaders and dissidents to the slave labor camps, then starving the remainder into submission. (41) A. The grain quotas for the Ukraine and Cossack regions were set abnormally high, even for relatively infertile zones. (3.75) B. Authorities were ordered to move seed grain to secure urban granaries in autumn of 1932. (6.75) C. The Ukraine was internally blockaded, so that food in nearby Russia could not be brought in, and Ukrainian peasants could not go out. (2.75) D. Secret police chief Menzhinsky was executed - and replaced with the anti-Ukrainian Yagoda - after protesting against Stalin's policies towards the Ukraine. (19.5) E. A, B, and C.
(26.25) F. A, B, C, and D.
The right answer comes in third; although in contrast to dekulakization, the existence of the Ukrainian famine has received a fair amount of attention in recent years. (50.5) A. was deadly because it forced migratory nomads to abandon their traditional way of life, without adequately preparing them to do anything else. 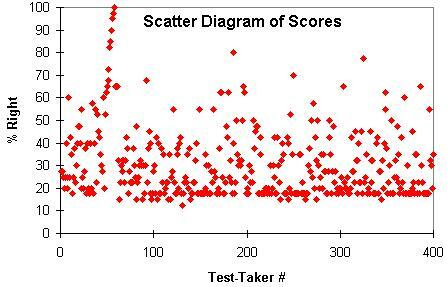 (5.5) B. concentrated on crushing the Islamic faith. (2.75) C. was a response to perceived pro-German sentiment among Kazakhs. (10) D. was, like the Ukrainian famine, deliberately inflicted. (1) E. provoked only token violent resistance. (30.25) F. A, D, and E.
A majority got this one right. During 1936-8, Stalin purged perceived enemies within the Communist Party. Out of 1966 delegates to the 1934 Party Congress, how many had been arrested for counter-revolutionary crimes by the 1939 Party Congress? (27.5) E. All but 115. (6.75) F. All of them. Stalin's victims within the CP were only a small minority of those he persecuted - but have received more international sympathy than any other victimized group. Still, nearly half of the answers grossly underestimated the extent of internal Party purges. (54.25) A. Poland and Germany. (9) B. Germany, Italy, and Japan. (6.75) C. Poland and Korea. (13) D. The Baltic nations, Finland, and Romania. (7.5) E. Poland, Germany, and Spain. (9.5) F. Yugoslavia, Bulgaria, and Greece. Virtually no one got this right. (46.25) A. Stabilized, with the incoming waves of deported kulaks approximately equaling the annual attrition rate. (11) B. Stabilized at around 10,000,000 in 1940, after over 1 million Poles were sentenced to the camps. (2.75) C. Did not increase significantly until the Great Terror, when the camp population doubled in size. (3.25) D. Grew sharply as a result of delukization, then slowly declined in spite of the Great Terror. (20) E. Never stabilized - reaching 20,000,000 by the end of World War II, and 25,000,000 by Stalin's death. (16.75) F. Declined to 1 million during World War II - as prisoners were given amnesties if they joined the Red Army - only to peak again at 3 million in 1948. Solzhenitsyn made the Gulag Archipelago famous, but few appreciate its extent even today. 20% gave a high answer; 11% got it right. The rest underestimated. (86.75) A. The deadliest of the slave labor camps in Siberia, where over 2 million perished. (1.5) B. The treatment received by purged Party members, totally ostracized by their former friends and family. (7) C. The canal built between the Baltic and the White Seas, constructed by slave laborers under conditions of extreme hardship. (3.75) D. The NKVD's solitary confinement cells in Moscow, which were completely unheated. (0.5) E. Stalin, by one of his revolutionary aliases. (0.5) F. Stalin's first wife, noted for her icy personality. A large majority got this right - presumably by process of elimination. Kolyma has nothing like the infamy of Auschwitz. (66.5) A. Stalin exterminated over 3 times as many Poles as Hitler did, even though the eastern zone held only half the population of the western zone. (2) B. Millions of Poles fled to the Soviet zone to escape even worse conditions inflicted by the Nazis. (4) C. Approximately equal numbers of Poles died in both zones, although the Nazi kill ratio was greater. (16) D. Tens of thousands of Polish intellectuals, officers, and other community leaders were executed by a special unified task force of the German and Russian secret police. (6.25) E. B and C.
(5.25) F. A, B, and C.
A sizable majority got this right. The 2nd most popular answer had some basis in fact - Russian and German secret police did cooperate to some extent, and there was an infamous massacre of Polish officers and other possible leaders. But this infamous massacre at Katyn was carried out solely by Soviet forces. (72.5) A. The Soviet sphere initially included eastern Poland, all three Baltic states, Finland, and part of Romania. (3.25) B. Germany "swapped" Lithuania for part of Poland. (1.25) C. Hitler and Stalin exchanged political prisoners to secure release of jailed comrades. (2) D. Stalin had annexed Finland by 1941. (2.75) E. 2-4% of the population of the Baltic states was deported to Siberia. (18.25) F. B and E.
The original Non-Aggression Pact's secret protocols gave Lithuania to Germany, not Russia, so (A) is incorrect. Amicable relations between the two totalitarian powers left room for later border adjustments. (53) A. Showed that Stalin's Great Terror had successfully eliminated most potential collaborators. (6.5) B. Convinced Stalin to immediately purge the Red Army, including the famed Marshall Tukhachevsky. (2.25) C. Convinced Stalin to temporarily dissolve the collective farms and internal passport system. (11.5) D. Sparked guerrilla uprisings amongst Ukrainians and Chechens. (20.25) E. Now appears to have been a pre-emptive strike against a planned Soviet invasion of the German Reich. (6.5) F. Was encouraged by the ability of the Baltic states to fight the Red Army to a standstill for almost four months. While many claimed that Stalin's persecutions eliminated a potential 5th column of pro-Germans, his policies bred entire nations eager to befriend anyone> who could free them from Stalin's yoke. (48.25) A. Large numbers of Japanese POWs. (7) B. Ethnic Germans, both POWs and civilians. (8.5) C. Millions of Soviet POWs. (0.75) D. Over half the population of Georgia and Armenia. (1.75) E. About 10% of the population of the Ukraine. (33.75) F. B and C.
Less than half of the respondents seem to be aware of the stern criminal sanctions imposed on Soviet POWs by its own government as a matter of course. (61.25) A. Over 10 million ethnic Germans were expelled from eastern Europe, and about 2 million perished. (2) B. After the Red Army had passed through eastern Europe, there were few ethnic Germans remaining to expel. (5.25) C. About 2 million ethnic Germans were expelled by the Communist-dominated governments of Poland and Czechoslovakia. (7.5) D. Over half of the "expelles" were deported east to Siberia, not west to Germany. (2.25) E. The United States and Britain typically ordered German refugees to return to their country of origin. (21.75) F. C and D.
(50.75) A. Soviet troops seized much of the industry of Manchuria. (3.5) B. Stalin refused to recognize the Nationalist government of Chiang Kai Shek. (6.5) C. Large numbers of landlords and "counter-revolutionaries" were executed in territory controlled by the Chinese Communist Party. (2) D. Mao's forces conquered Tibet and sent over 1 million Tibetans to slave labor camps. (23) E. A and C.
(14.25) F. A, B, and D.
About a quarter got this right. (61.5) A. Dzerzhinski and Trotsky. (6) B. Yagoda and Tukhachevsky. (5) C. Kamenev and Zinoviev. (6) D. Kirov and Bukharin. (3.5) E. Kirov and Yagoda. (18) F. Yagoda and Yezhov. (54.5) A. Stalin tried to veto Mao's effort to form a coalition government with Chiang's forces. (0.5) B. Soviet troops occupied Tibet during the 1930's. (2.75) C. Mao disapproved of the show trials of Zinoviev and Kamenev. 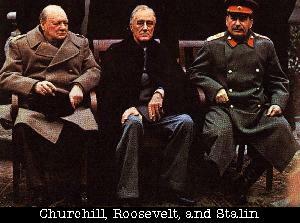 (3) D. Stalin vetoed a joint Soviet-Chinese invasion of Japan. (18.75) E. Stalin doubted Mao's chances for success, and therefore gave him little assistance. (20.5) F. All of the above. The right answer was a distant #3. (55.75) A. Permitted joint membership in the Chinese Communist Party. (7) B. Accepted several prominent Soviet advisors. (3.5) C. Sent Chiang to Moscow to work out a deal for military aid. (2.5) D. Had its army's officer corp trained by Soviet experts on Whampoa Island. (1.25) E. Appointed Mao Zedong as second in command of its Propaganda Ministry. (30) F. All of the above. The right answer came in #2. Two of the best-kept secrets of 20th-century history are the Kuomintang's Communist connections and Chiang's ranking as the 4th greatest mass murderer of the century (beaten out only by Stalin, Mao, and Hitler). (2) B. Assistance in setting up a "Chinese Gulag." (3) C. Large grants and no-interest loans for purchase of technical equipment. (29.25) E. A and B. (10.25) F. A, C, and D.
The right answer again comes in second place. (54.5) A. Had an annual death rate in excess of Stalin's Gulag. (8.25) B. Had over 10,000,000 inmates. (2) C. Had little economic function. (1.5) D. Consisted mainly of Chinese POWs from the Korean War. (30.25) E. A and B. (3.5) F. C and D.
The right answer came in third. The descendant of Mao's Gulag has recently received international attention due to the efforts of such human rights activists as Harry Wu. But the long and brutal history of the Laogai remains almost unknown in the West. (Moreover, the best-publicized persecution in the West remains the intra-Party purges of the Cultural Revolution, not the far larger oppression of the broader Chinese population). (57) A. Land Reform, the Great Leap Forward, and the Sufan Purge. (2.5) B. The Resist-US-Aid-Korea campaign, the Great Leap Forward, and the Let a Hundred Flowers Bloom campaign. (10.75) C. Land Reform, "suppression of counter-revolutionaries," and Resist-US-Aid-Korea. (1.75) D. Collectivization, the Great Leap Forward, and the Gang of Four trial. (19.25) E. Collectivization, the Great Leap Forward, and the Cultural Revolution. (8.75) F. Land Reform, the Great Leap Forward, and the Let a Hundred Flowers Bloom campaign. The right answer comes in third. (19.5) C. The Great Leap Forward. (20.5) D. The Cultural Revolution. (1.25) E. The Lin Biao purge. (0.25) F. The Gang of Four trial. Barely 20% could identify the single greatest calamity sparked by the willful blindness of a Communist regime. (54) A. Took back the land given to the peasants in the Land Reform campaign. 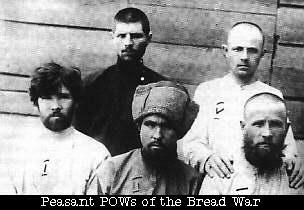 (4.25) B. Collectivized agricultural and purged millions of "kulaks," or wealthy peasants. (3.75) C. Consolidated collective farms, and introduced common barracks and kitchens. (4) D. Required villages to set up makeshift steel mills fed with scrap metal. (10.5) E. C and D.
(23.5) F. A, B, C, and D.
(52.75) A. Move to the city. (0) B. Choose their occupation. (1.25) C. Demand payment for their work for the commune. (1) D. Keep the house they occupied. (2) E. Keep their own tools. (43) F. None of the above. Mao always sensed that a faction within the Chinese Communist Party favored pragmatic compromises with capitalism rather than permanent revolution. "Revisionists" within the Party were the subject of this great internal purge - and nevertheless managed to regain power under Deng. (87.25) A. Strongly and increasingly negative, leading him to announce that the Soviet Union was ruled by revisionists who had restored capitalism. (4.75) B. Mixed, since the Chinese Communists had been treated so poorly by Stalin. (2.5) C. Mixed, because Khrushchev was able to win China the diplomatic recognition of the United States. (2) D. Generally positive, though he defended Stalin's memory to win the support of the Indonesian Communist Party and the Khmer Rouge. (1) E. Positive, although he opposed the relaxation of censorship. (2.5) F. Unconditionally supportive, for Mao like most of the Chinese Communist Party was used to sudden reversals in the Party line. Almost everyone got this right. (51.25) A. Mao seems to have struggled to prevent it. (10.5) B. It targeted intellectuals who later denounced the Cultural Revolution in their work. (3.25) C. Some of its victims ultimately regained power. (0.5) D. It provoked border clashes with India. (31) E. B and C.
(3.5) F. A, B, and D.
The right answer comes in second. (71.75) A. The post-war expulsions of ethnic Germans from Poland, Czechoslovakia, and other countries. (6.5) B. Deportation of Poles to Siberia. (9.25) C. The 1956 invasion of Hungary and subsequent deportations. (1.75) D. The 1968 invasion of Czechoslovakia. (5.5) E. Tito's "anti-Comintern" persecutions. (5.25) F. Executions of persons attempting to escape from East Germany. Which of the following Communist leaders were not trained in the Soviet Union under Stalin? (0.75) D. Ho Chi Minh. (11.5) E. A and C.
(14.75) F. C and D.
The Communist "conspiracy" was never particularly well-veiled: training in Soviet schools of revolution was a virtual internship for aspiring Communist dictators. (52.75) A. Was unable to maintain its hold on power without the continuing presence of Soviet occupation troops. (0.75) B. Tried to moderate the abuses of Stalin's "personality cult." (5) C. At one point "rented" slave laborers to the Soviets for use in Siberia. (4) D. Officially registered about 50% of the population as a "hostile class." (7.75) E. A and C.
(29.75) F. C and D.
Ironically, the more oppressive the dictatorship, the harder it is to gather evidence about the magnitude of its atrocities. But the fall of the USSR has released some evidence on Kim Il-sung's crimes, including his role in a bizarre inter-government slave trade. (54) A. Worked as a Comintern agent in China during the 1920's. (0.75) B. Waited until French withdrawal to execute nationalists and purge the Communist Party of "Trotskyists." (3.25) C. Killed several hundred thousand Vietnamese landlords and their families during the 1950's. (4) D. Set up "re-education camps" and "special economic zones" in 1975 to punish his opponents in South Vietnam. (10.75) E. A and C.
(27.25) F. A, B, C, and D.
The #2 answer overlooks the fact that Ho died a number of years before the fall of the South. (62.25) A. Over 95% were Vietnamese. (6.25) B. Many were "boat people," or refugees who were forced to flee Vietnam on unseaworthy boats to avoid execution or slave labor camps. (1.5) C. Few were killed in "re-education camps," which were atypically mild for a Communist regime. (1.25) D. Almost all were exterminated during wartime. (18.75) E. A and B. (10) F. A, B, and D.
(54.5) A. Forcing the entire urban population into forced agricultural collectives, where they worked under conditions of extreme hardship. (1) B. Exterminating ethnic Chinese, Vietnamese, and other minorities. (0.5) C. Executing Cambodians unable to speak French. (0.75) D. Imposing Buddhism on Cambodia's Catholic and Muslim minorities. (35.75) E. A and B. (7.5) F. A, B, and D.
(52) A. Was a moderate socialist who ended large-scale killing in Cambodia. (11.5) B. Worked closely with Vietnamese forces as they murdered several hundred thousand additional Cambodians. (2) C. Largely abolished Cambodia's slave labor camps. (3.25) D. Had about 5% the annual murder rate of Pol Pot's regime. (6) E. A, B, and C.
(25.25) F. B and D.